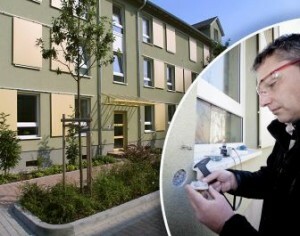 An impartial report on the insulated facade of the 3L house shows that its thermal insulation material Neopor, supplied by BASF, is still in good condition 12 years after the building was modernized, according to the German chemicals company. Modernization work on the multi-unit building had included application of an external thermal insulation composite system (ETICS). This report by Achim Bauer, an accredited expert in the stucco plaster field, finds no visible aging on the plaster facade. Nor does it find any algae growth. Samples taken on the building’s facade and plinth show that both the insulating material and the plaster are in excellent condition. According to the Federal Ministry for Transport, Building, and Urban Development’s evaluation system for sustainable construction, an ETICS generally has a service life of around 40 years. The facade of this old building owned by LUWOGE GmbH, the housing company of BASF, was insulated with an ETICS from Caparol during modernization 12 years ago. This made it the first older building to meet the 3L target. The insulating material was Neopor expandable polystyrene (EPS) with a thickness of 200mm and a thermal conductivity level of 035. The addition of tiny graphite particles gives Neopor both its silver-gray color and its special performance properties. Neopor’s insulating performance is up to 20% better than white EPS insulating material, says BASF. In 1998, the company became the first EPS manufacturer to add a gray insulating material to its portfolio. Besides the insulating material, the evaluation also covered the overall state of the facade. Occasional cracks were located especially around the windows and doors that caught the expert’s eye. The samples taken however were a clear proof that the cracks in the facade were due to processing mistakes in applying the insulation, not in changes to the underlying insulation panels or in other parts of the insulation system, BASF emphasizes.